Figure 915: Before Watchmen: Dollar Bill was a late and (even by the standards of Before Watchmen) somewhat gratuitous addition to the line. Previously in The Last War in Albion: The myriad of Before Watchmen projects ranged from decent but flawed (Darwyn Cooke and Amanda Conner) to blandly mediocre (Brian Azzarello) and downright wretched (J. Michael Straczynski). But there was none quite so awful nor indeed insulting to Moore as the work of Len Wein on Before Watchmen: Ozymandias and Before Watchmen: Dollar Bill. It’s an astonishingly vicious backstab of a statement. What’s perhaps most striking is the pettiness of some of the turns of phrase - the distancing involved in describing how Moore “apparently” feels about Watchmen, for instance, as though Wein does not know full well the minute particulars of what went down. Like Levitz’s “stage magician” description in his book, it’s deliberately and contemptuously dismissive; a statement made with the full knowledge that its subject, having declared his complete opposition to the entire project, will never even bother to refute it. Wein similarly knows full well that the phrase “creator ownership” was never uttered by him or anyone else with regards to Swamp Thing, that it had been a work-for-hire creation from the get-go, and that Watchmen was an entirely different situation, making the comparison little more than a condescending declaration that after twenty-five years in which Moore produced countless classics of the medium and Wein produced nothing of even slightly enduring value Moore somehow still owed his success to Wein, as opposed to Wein owing his first high-profile gig in ages to his willingness to spit in his former friend’s face. And as for the word “selfish” being used as criticism by the patsy of the people who take 92% of the earnings of Watchmen for doing little more than changing the cover on it every few years and diluting its value with bad movies and spin-offs, well, what is there to say? Figure 916: The alien in the 1963 Outer Limits episode "The Architects of Fear," which was not actually an influence on Watchmen in any meaningful sense. Wein’s pettiness continues seamlessly in Before Watchmen: Ozymandias itself, where he goes out of his way to regrind quarter-century old axes. Most notable is a longstanding disagreement between Wein and Moore over the particular details of Ozymandias’s scheme, which Wein objected to on the grounds that it was similar to a plot point in an episode of The Outer Limits. Moore, in his telling, stumbled upon the description of the episode after he’d worked out the broad strokes of Watchmen, although it’s certainly possible that he’d seen the episode. For Wein, however, it was apparently a major issue; as he tells it, “‘I kept telling him, ‘be more original, Alan, you’ve got the capability, do something different, not something that’s already been done!’ And he didn’t seem to care enough to do that,” resulting in Wein leaving the project and letting Randall take it over. Moore ultimately put a nod to the episode in the final issue of Watchmen, with the television in Sally Jupiter’s room playing an ad for it in the pentultimate scene, but the issue apparently irked Wein enough that he felt it necessary to have an extended scene in Before Watchmen: Ozymandias #5 in which Ozymandias is directly inspired by the episode. In practice, the entire issue is another misguided priority dispute on the level of the Charlton characters or Superfolks; the plot point is similar, but the overall stories have almost nothing in common. The suggestion that the resolution constituted Moore being too apathetic to do something different is more insulting for its sheer stupidity than for its insinuations about Moore’s character. But reading Before Watchmen: Ozymandias it is fairly evident that Len Wein just honestly didn’t understand how Watchmen worked. When he enthusiastically says in interviews that “what has surprised me about writing Ozymandias is how much we actually DO NOT know about him, despite all the back-story he supposedly provided in the original series,” he misses a fundamental aspect of writing about a character that Moore described in the early pitch documents (which Wein would presumably have read as the original editor on the project) saying that “the whole point behind the way I think Thunderbolt should be treated is that we should try to make the reader keenly aware of just what it would be like to be ten times more intelligent than the most intelligent human that ever lived,” and remarking that most people “can’t even begin to imagine what goes on inside the head of someone ten times more intelligent than they are, and for the most part they don’t try.” An essential part of this, in Watchmen itself, is that the reader never actually sees any of Ozymandias’s major leaps of logic as he’s making them. Everything is described as a realization already had, narrated by Ozymandias to people he clearly does not believe could ever possibly understand him. This lets Moore evade the problem of how to represent the thinking of a mind infinitely superior to that of his own or his readers. Wein, on the other hand, composes a six issue monologue by Ozymandias to his private diary in which he explains his life story and all his plans. This leads to two problems. The first is that the writing is shockingly awful. 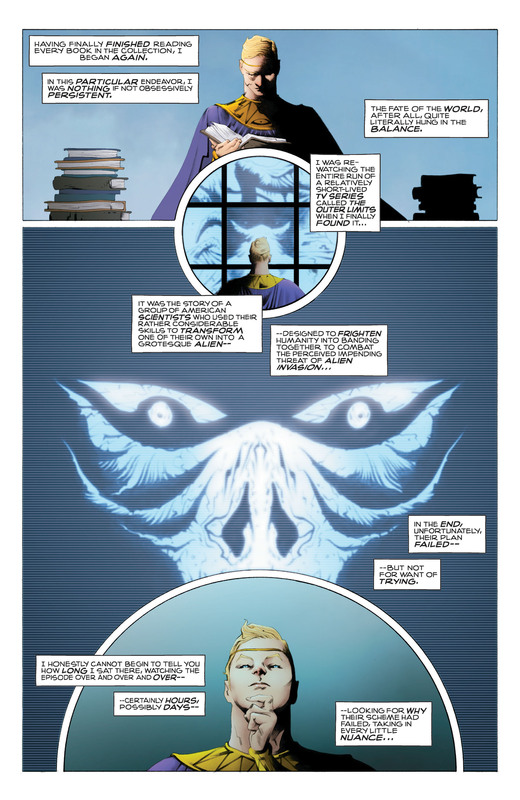 The second issue, for instance, begins with the following monologue: “As my beloved pet Bubastis and I go through the now almost-automatic motions of our daily exercise routine, my thoughts fly back through the years to the tragic night long before when an accidental drug overdose stole my precious Miranda from me forever. Weeping at her bedside, I was determined to hunt down those responsible for her death, and make them pay for their crimes. To protect my anonymity and my corporation’s swelling fortunes, I donned a colorful costume I’d had made for an upcoming halloween party and struck out through the dark bowels of my city in search of the welcoming gates of hell.” It is not that the tone of preening pomposity is out of character for Ozymandias; indeed, the megalomania is in many ways the point of the character. It’s just that it’s bad. But the larger problem is simply that Wein ends up presenting Ozymandias as a moron. The ability to see every detail of his own self-justification strips away the monstrously compelling logic that underlies Ozymandias’s actions in Watchmen. The gaps that Wein observed were not invitations for detail, but conscious points of ambiguity that allowed Moore to create a character with a compelling illusion of unfathomable genius. Any attempt to put his actions into sharp focus, especially one that depends on such cheap and hackneyed tropes as “he becomes a superhero to punish the drug dealers he blames for his lover’s death” serves to undermine the basic concept of the character. 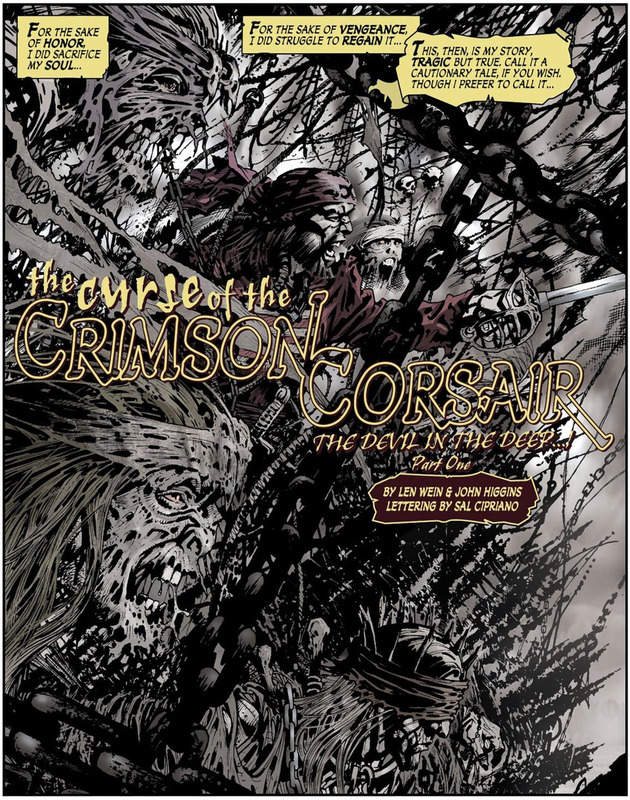 Figure 919: The Crimson Corsair backups, originally intended to conclude in a one-shot issue, proved to be a source of creative tension within the Before Watchmen project. That big last statement Wein makes is pretty ironic, yeah. It's funny how people seeking to justify something often so obviously tell us more about them than they intend to and don't seem to realize it. Does that mean it's worth paying actual money for? Or should I just make a note to spend giftcards on it? Having read them, I'd say just get them out of the library. Is there a reason we're spending weeks and weeks on these awful books? I mean, it's fun and all, but it's not really telling us anything about Moore or his work. I mean, we just finished doing so. But ultimately, because they're part of the War at large, and it seemed like it would be banal to cover them along with Journey into Mystery, Happy in 2012. And because it was funny to parallel them with Under the Hood, the lengthy text piece on what happened before Watchmen. The next chapter's post-chapter parenthetical will be on an entirely different topic. Even though I have only read one issue of Before Watchmen - the first Ozymandias - I'm finding this stretch a great read, as it offers a lot of insight into the watchmen issues, Moore and other players such as Wein. Fascinating, thanks Phil and have a good holiday season when it comes! I'm surprised you didn't mention the most abhorrent example of DC being entirely soulless in regards to Before Watchmen (belatedly surprised, since I forgot what book it was), which was turning their eulogy for Joe Kubert into a plug for Nite Owl, without mentioning any of the work he'd done for them earlier. I saw Len Wein in a panel discussion with Grant Morrison and Dave McKean at the Sydney Opera House. Wein came across as a genial huckster, telling stories about his friendship with Hugh Jackman, and basically provided comic relief to break up stories about Sandman and drug aliens. I read his original Swamp Thing run. It's not terrible, tho a bit Nice Guy. Moore would have broken through without him though. The previous night Morrison did a talk with Gerard Way from My Chemical Romance (who covered Dylan for the Watchmen soundtrack). It started with a spoken word piece by GM about language, superheroes and Rupert Murdoch that should be online, and is worth a listen. Again with the 92%? It's not true and you know that. DC doesn't even see 50 or 60% of the money (the distributor/retailer cut). Also, although no one in the english-speaking world seems aware of that, pirate comics (even straight pirate comics, not One Piece-style affairs) are still fairly common in France. Right, sure, okay, and it costs money to print comics too I guess? I thought it was pretty clear in context that this was a reference to DC keeping 92% of the net profits and passing on only 8% to the creators, not an assertion that 92 cents out of every dollar spent on Watchmen trades/movie tickets/whatever goes straight to DC, with the other eight cents split between the comic shop, movie theater, actors, studio, printer, truck driver, distributor, Moore and Gibbons, the t-shirt factory, etc. Is Moore and Gibbons royalty only paid on the profit though? Or even the net cost? To invoke another (War-relevant) example, obviously I don't know the exact specifics of Morrison and McKean's royalty arrangement for Arkham Asylum, but the figure of a dollar each per copy has often been bandied around. A $2 creators royalty on the original retail price of $24.99 is... pretty much 8% exactly. So, unless Morrison and McKean - in DC's eyes at least, two untried, untested quantities when they signed up to do the book - were on a royalty arrangement that was much better than the 'special deal' that DC gave Moore for Watchmen (which seems unlikely), then Moore and Gibbons' portion of the cash for each copy of Watchmen is probably far far in excess of 8% of the net profit on the book. Yeah, good point. I don't know, either answer is plausible: Moore and Gibbons thought the profit-sharing phase would be short-lived while the book was in print, so it's entirely possible that they didn't bring their full negotiating power to bear on that percentage and the "specialness" of the deal rested on their future ownership. McKean and Morrison obviously had that example to learn from, and would have worried more about what they were making while DC published the book and (much) less about what would happen in the unlikely event that DC let it slip out of print. But yeah, probably 8% of gross or 8% of wholesale is more likely. I still think "DC are the real victims because most of the money goes to shops/Diamond/the printer" is a bit of a derail.